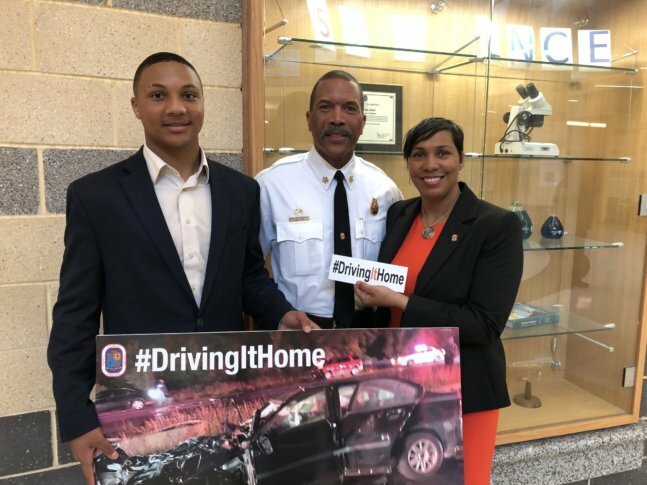 With poster board-sized pictures of wrecked cars and bumper sticker-sized car magnets with the message #DrivingItHome, Prince George's County Council Member Monique Anderson-Walker and Fire Chief Benjamin Barksdale helped launch the countywide initiative at Oxon Hill High School on Friday. After a series of serious and deadly crashes along Maryland Route 210/Indian Head Highway in Oxon Hill, Maryland, county leaders are trying something different: launching a safety campaign that targets the younger generation. “We’re calling it ‘Driving It Home’ because we’re really focused on driving home the message of safety, changing the culture of driving; no road is dangerous; it is people making bad decisions,” Prince George’s Council council member Monique Anderson-Walker (District 8) said. With poster board-sized pictures of wrecked cars and bumper-sticker-sized car magnets with the message #DrivingItHome, Anderson-Walker and Prince George’s County Fire Chief Benjamin Barksdale helped launch the countywide initiative by addressing an assembly of students at Oxon Hill High School on Friday. They seem to have made an impression on at least some students. “I’m supposed to wear my seat belt, never text and drive, never drive intoxicated and always make sure I’m focused and not distracted with people in my car,” senior Liana Tate, 17, said. The safety message reinforced a lesson senior Channing Neal, 17, learned early. When she was a child, she and her family were in a wreck that injured both her mother and brother. She said their car was rear-ended by a distracted driver, who stumbled from his vehicle looking dazed and saying he was overtired. Barksdale told students how difficult it is for first responders who go to preventable wrecks, where people are seriously injured or hurt so badly that they can’t be saved. Five children, between the ages of 5 and 15 who were all related were killed last month in a wreck on U.S. 301 in Prince George’s County. None of the children was properly restrained, all were ejected from the vehicle. “Our people were there, and there was nothing that they could do,” he said. Barksdale said there are systems in place to help people process difficult emotions from tragic events, but first responders would be healthier and better off not having to be exposed to those types of situations. Barksdale said he hopes students go home and tell their parents what they heard.